← Do You Have Scary Code? Another post for me that is simple and hopefully serves as an example for people trying to get blogging as#SQLNewBloggers. I wrote recently about adding extended properties. Updating them is very similar. 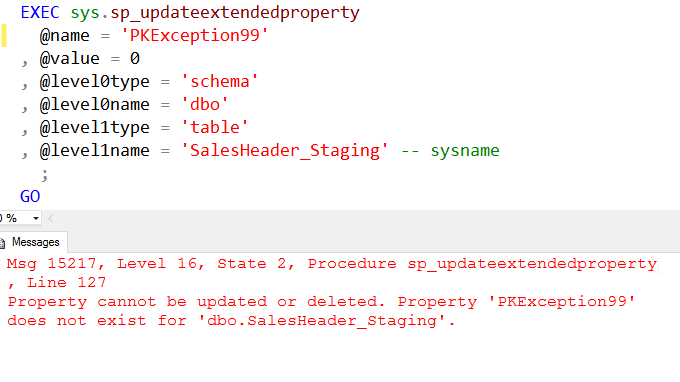 There’s an analogous procedure called sp_updateextendedproperty that changes the value of properties. The arguments are again, unintuitive, but the more I work with extended properties, the more comfortable I become. In this case, I have the same name and value, and then the level 0,1, 2 items with both a type and name. I highly suggest, however, that you name your parameters, including the names in your calls so programmers running across the T-SQL aren’t depending on position for an understanding of the parameter. However my property needs to exist. If I call this procedure with the wrong property, I get an error. This means that you need to be sure that the property exists before you update it. Good code would have the error handling somewhere. After writing the previous post, this one took only about ten minutes to do the typing. I’d been working with extended properties, so I had the code and just needed to take the screenshot.